From work to school to kids to housework, your life can get pretty stressful, but you don’t have to let that stress take over. If you put just a couple of minutes per day into resting your mind, you can gain back that feeling of rejuvenation and take on all your responsibilities without feeling bogged down. Maybe stress isn’t the issue, though. Perhaps you’re looking to boost your focus or learn how to ease your anxiety. Whatever you’re in the market for, consider starting with these healthy mind apps. Headspace is like a “gym membership for the mind.” With it, you can spend just 10 minutes per day learning the basics of meditation so you can train your mind to cool off when you need to. The first 10-day program is free, but if you like Headspace’s methods, you can subscribe for more features. Enjoy exercises in everything from relationships to anxiety. Track your stats, share them with friends, and set reminders to meditate! This app is available for mobile and web. The Stop, Breathe & Think app is designed to help you slow down with life and get in touch with your feelings. With just five minutes per day, you can practice breathing and mindful meditation, and this app will help you stay on top of these exercises. This app is free for iOS, Android, and web users. The Happier app isn’t about meditating, but it will help you become more mindful about the positive things in your life—which is sure to bring a smile to your face and reduce stress. Really, this is a gratitude journal app, but with a community of others using the app, you may feel more motivated to share your smiles throughout the day. But don’t worry—you get to control who sees your gratitude journal. Get the app free on Apple and Android products. While not a stress-relieving app, Lumosity can still do a lot for your mind. If you’re seeking an app that can help boost your brain power and increase your memory and focus, then Lumosity is among one of the most popular. The mobile app is free with your subscription to Lumosity. You can, however, start with a limited free account to see what it’s like and to begin playing games designed to improve your mind. If poor sleeping habits are what have you down, SleepBot can help. This app tracks your sleep cycles so you can change them for a better night’s rest. It will even record movement and sound and gently wake you up each morning. SleepBot is free for iOS and Android. The Mindfulness App is another meditation app that puts you in control of your meditation sessions. Choose from different types of meditation, and decide how long you want to spend meditating. Plus, you can track your meditation habits over time. Buy the app for $2.99 in the App Store. 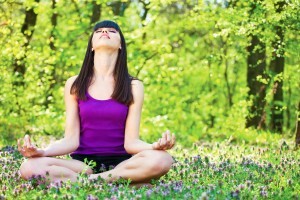 The app allows you to purchase extra guided meditation sessions as needed. Breathe2Relax is an app that can help reduce stress and anxiety. It can also help you calm down if you’re angry and help stabilize your mood through breathing exercises. Plus, you can record your stress level to practice mindfulness and track your progress. Find this app for free on Apple and Android products. Sometimes it takes support—such as that from a mobile app—to start practicing mindful exercises to reduce stress and improve memory, positivity, and focus. Which one of these apps will you start with to reach your goals? This entry was posted in Informational, News and tagged Health, healthy mind. Bookmark the permalink.